For thousands of years, art has remained an important part of human culture and expression. But, of course, it has undergone a great deal of transformation as new technologies have emerged. If you’re a professional artist or designer working in today’s interconnected world, you don’t necessarily need access to a physical notepad and pencil to get your creative juices flowing. With your trusty computer, it’s possible to create amazing masterpieces with a mouse or indeed stylus, when used in conjunction with a software package replete with all manner of virtual tools and paintbrushes. Many of these applications work alongside electronic sketchpads and other hardware, making it even easier to develop amazing artwork. Another obvious benefit is that these apps come with built-in effects, filters and editing features so you can really jazz up your creations. Here’s our pick of the best drawing and painting software which is currently available. When it comes to creative software, Adobe has dominated the scene for decades, and Photoshop CC (CC stands for Creative Cloud) is loved by artists and designers across the world. It provides creative types with a plethora of cloud-based tools to create and enhance photos, illustrations and 3D visuals. This software isn’t just about editing photos. If you’re a professional designer, you can use it to create packaging, banners, websites, logos and icons. Not only can you come up with your own creations, but you’re also able to make use of intuitive templates if you’re more of a beginner, or you’re working to a tight deadline. You can design your own illustrations and turn images into paintings as well, with the option of switching between animate and print-style options. When you’ve created a piece, you can enhance it with a range of built-in effects. There are multiple pricing tiers, depending on which other apps and features you’d like bundled with Photshop CC. The cheapest is the Photography level at $9.99 per month and also comes with Adobe Lightroom CC, as well as 20GB of cloud storage. Up from that is the Single App plan at $20.99 per month and comes with 100GB of cloud storage, as well as Adobe Portfolio, Adobe Fonts, and Adobe Spark. For the All-Apps plan you get access to all Adobe creative desktop and mobile apps as well, and that costs $52.99 per month. Autodesk SketchBook is a drawing app targeted specifically at designers, architects, concept artists and other creative professionals. If you fit into any of these categories, the software will give you the tools to sketch and create stunning illustrations easily and quickly. It sports a minimalist interface that works across Windows, Mac, iOS and Android devices, as well as 140 pre-designed brushes. Should you not be able to find the brush you need amongst that lot, you have the option to tweak them and import your own. Another neat feature is the ability to add an unlimited amount of layers to your creations, all of which come with blending nodes and grouping abilities. The software costs $16 monthly or $126 yearly, but whichever package you choose, there’s a lot of support on offer. For instance, you can schedule a call with Autodesk’s customer support team if you have any questions about the software, or indeed chat online or via email. You also get access to the company’s knowledgebase, which contains extensive documentation, tutorials and training videos. Corel offers a host of creative software packages, one of which is a drawing app called Painter. Aimed at designers, artists and students, this cross-platform application provides you with the likes of ‘thick paint’ which you can daub onto your digital canvas, and then scrape around or blend to create some highly realistic looking masterpieces. There’s a large selection of brushes, with the ability to create custom brushes and palettes – plus you can import these, too. 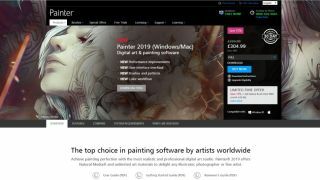 Painter is a downloadable app which is available on both Windows and Mac. It’s compatible with third-party software like Photoshop and drawing tablets from companies such as Wacom, as well. As for the price, for the latest version of Corel Painter is available for around $400, though there are special rates for an education edition for students and learning centers. Developed by artist Peter Blaskovic, Rebelle 3 is another highly versatile drawing and painting application. Described as “one-of-a-kind paint software”, it’s been designed for creatives working on watercolor, acrylic, wet and dry media artwork. Blaskovic created the app as part of his experimental drawing projects and wanted an easy-to-use program to access natural painting tools on-the-go. The app uses realistic color blending, wet diffusion and drying techniques, and offers a plethora of watercolors, acrylics, inks and pastels. There are also ‘dry’ tools like pencils, markers and erasers, so you don’t have to stick to paintbrushes. The app also boasts some interesting capabilities like the ability to tilt the canvas you’re working on. What’s more, Rebelle works with Photoshop, allowing you to tap into 23 additional blending nodes. It currently costs $89.99, but you can give the app a spin via a free trial. Artweaver is one of the oldest painting tools out there, and the software is now on its sixth edition. The application provides you with a diverse set of predefined brushes and pencils that can be used to create amazing pieces of art. Not only does Artweaver offer an intuitive and easy-to-use interface which makes it suitable for novices, but it also boasts an impressively configurable brush system. So while you can choose from a variety of predefined brushes, you can also tweak them to suit your exact needs. Furthermore, Artweaver has another strong suit when it comes to working on joint art projects, because you can use the app to collaborate with other folks on the same document. Of course, you’ll need to be online to do so. Want to get a better idea of your artistic process and exactly how it flows? Then you can get the application to record your work. That way, you can review, evaluate and improve your abilities (hopefully). Currently, Artweaver is only available on Windows, but it’s temptingly cheap at $47 – and there’s also a free version available though it has limited functionality compared to the paid version. While we’ve covered some of the big hitters when it comes to drawing and painting software, there are some good lower-level programs worth considering if you’d prefer for not to pay out for a big program. Here we’ll look at some of the other alternatives you might want to consider, especially if looking for something more entry-level, or simply competent when it comes to art and design. PaintShop Pro is a neat little art program. Although not as full-featured as some of the above it’s still very competent software for many aspects of art and design. Whether it’s photo editing, drawing, or creating/designing graphics, there are a lot of tools and additional plugins available to get the effect you want. Originally developed by Jasc, it’s now part of the Corel stable of creative programs and is available for around $80. Adobe Illustrator can sometimes be thought of as being the little brother to the more powerful Photoshop, but don’t overlook its possibilities. While Photoshop was originally built for photo editing, Adobe Illustrator has always been designed around illustration and drawing. You don’t need to choose between one or the other, however, as if you subscribe to even the basic level Adobe creative apps plan, you can have both Photoshop and Illustrator together. Sketchup is more focused on 3D design rather than general painting and drawing, but is worth considering if that’s the main reason you need software for drawing. Even better is that there’s a free version, but even the paid-for versions are relatively cheap by comparison to some of the above, with an annual cost of $119 or $299 according to how many features you want to unlock. GIMP is a dedicated art program specifically built to run on Linux operating systems. While it may not be as powerful as some of the software listed, it makes a big effort to do a lot of things, from photo editing to sketching to design. Anyone who already works with Linux has probably heard of it and even has a copy, but if you were thinking of moving to Linux but weren’t sure what creative software was available, you could do a lot worse than try out GIMP. Microsoft Paint is a basic art package that comes with every Windows install, and has done so since at least Windows 3.x. The release of Windows 10 has seen 3D editing tools added to it, but let’s be fair-it’s still a simple program that isn’t going to rival anything else on this list. However, because of the easy availability of MS Paint it’s worth mentioning – if nothing else because it does have a basic toolkit that is expanded on by other software.